You don’t just play the game, you ARE the game! After a brief introduction, each team puts on lightweight vests with attached phaser and enters an alien world, ready to seek, find, and deactivate opposing team members and their base station for points. 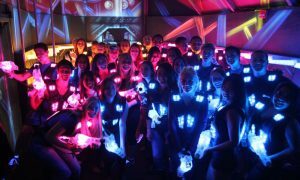 The arena is one of the only TWO-STORY Laser Tag facilities in Georgia! It also consists of barriers, strobe lights, police beacons, black lights, hiding spots, base stations, sentries and more. The object is to out score the other team. Points are awarded for tagging the opponents base station and by tagging other players. Loud heart pumping music surrounds you as the red laser beam cuts through the fog surrounding you. You know your opponent is near! Turning around, you see him near your team’s base station that you’re trying to protect. Suddenly in the black-lit fog enshrouded arena, an array of multicolor lights flash across your opponent. You seize the opportunity, aim and fire! Seeing his sensors flash red and green, you know that you have just brought your team one point closer to victory! Click the pics below to see our 2-Story Laser Tag Arena!